Join us as we discuss all the cool things we learn, and have learned, about growing a small business. Mostly marketing, technology, business development, and the occasional cool USB Flash Drive. Most people look at flash drives as simple little electronics products. In reality Flash drives are a commodity much like wheat, gold, and gasoline. Like those things USB flash drives are not exempt from the volatile world of supply and demand. 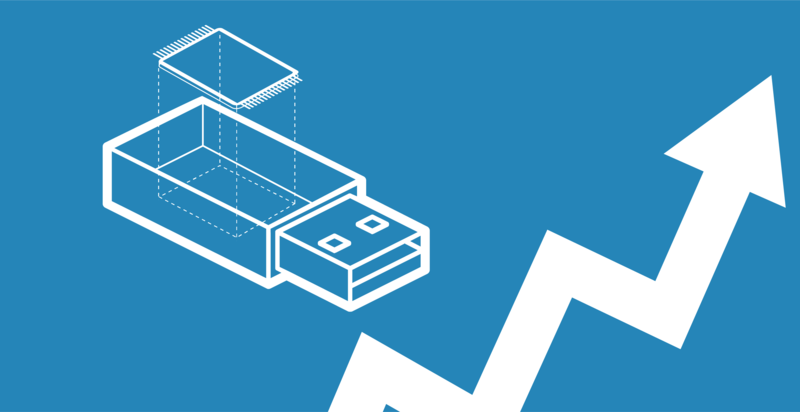 As the global stock of flash drives dwindles so the cost of those flash drives rises. However, it is not exactly true to call a "USB Flash Drive" a commodity. The flash drive itself isn't the commodity, but what they are made of is. So what exactly is inside a flash drive? USB flash drives are made up of four main components: NAND Memory, a microcontroller, a USB connector, and the little green board called a PCB that everything is attached to. USB flash drives also have a plastic case, but that doesn't help them work one bit. The real star of a USB flash drive is the NAND Memory, or flash memory hence the name flash drive. Every picture, song, video, and PDF that you save on a flash drive gets broken down into billions of little 'bits' of data. Those bits get stored into cells in the NAND memory chip, kind of like a really really tiny grid of little holes. There are billions of cells that are all extraordinarily small so small it takes an electron microscope to see each cell. Since NAND Memory relies on having more cells to store more data the smaller you can make them the more data you can store. It also makes it more cost effective since you are able to make more smaller memory chips at a single time. So manufacturers of NAND memory are constantly pushing the boundaries of the technology making them smaller and smaller. They also look for different ways to increase the amount of cells. Which has led to the invention of 3D NAND Memory cells. 3D NAND Memory takes the grid and expands it upwards, kind of like a tiny little data storage apartment building with multiple floors. You might be asking what all this has to do with commodities and pricing. Well it all has to do with supply and demand, more so lack of supply and massive demand. There are tens of thousands of products that use NAND Memory: TVs, iphones, ipads, thermostats, coffee makers, refrigerators, gaming consoles you get the point. Pretty much anything that has a power button nowadays has NAND memory in it, and all that puts a huge strain on the manufacturers. For the past two years demand has been outpacing manufacturers ability to produce NAND Memory and every month the stockpile of chips they have dwindles. This has been compounded by the introduction of 3D NAND technology. As new products demand more and more storage space manufacturers are in a rush to deploy the new technology. All the major manufacturers have been focusing on completing new fabrication facilities specifically geared towards 3D NAND. Since 3D is the future of NAND there are currently no new 2D NAND fabrication facilities planned or under construction. So until the manufacturers can bring the new fabrication plants online the currently fabrication plants and the limited stockpile are all that we have to hold us over. Unfortunately the situation is even more complicated. Huge mobile device manufacturers produce 100s of millions of units each year, and typically right around the holiday season. This spikes the demand 3-4 months before the release of new units. The main culprit is Apple Inc. and the iPhone. They place orders for 10s of millions of chips at a single time driving up cost for the rest of the market. There is a bright side to all of this though. 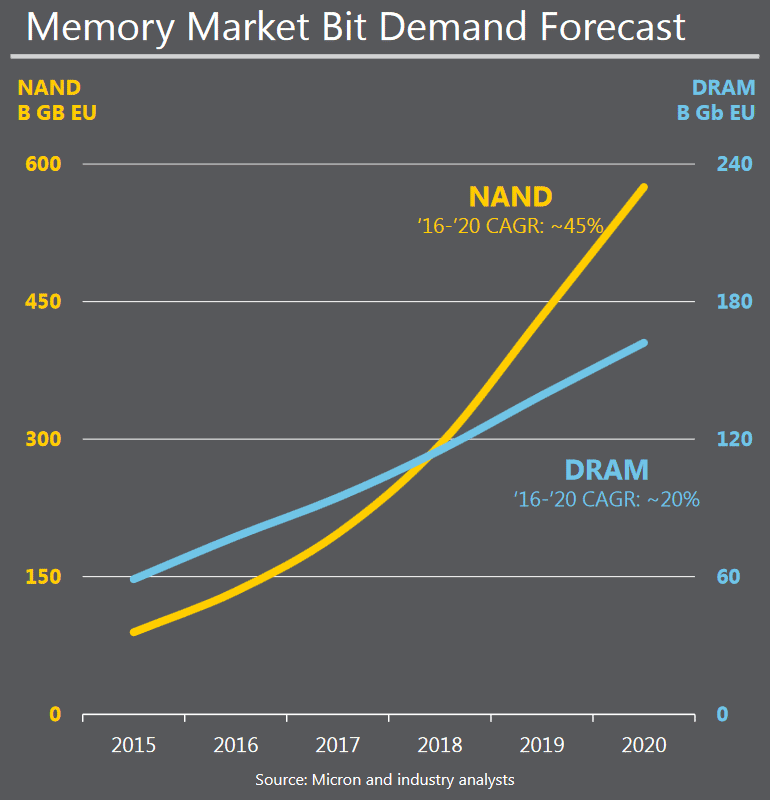 3D NAND will save us, we just have to be a little patient. The new technology is by far more efficient than 2D meaning that costs will fall once manufacturers get all the "kinks" worked out. We can also expect more reliability and larger storage capacities for lower prices. In the meantime all we can do is plan and plan well. Luckily for our customers we have been in business for over a decade and that has allowed us to practice... a lot of practice. We have become very adept at predicting market trends and using intelligent purchasing decisions to mitigate price movements. With an effective purchasing strategy we can hold prices lower for our customers and maintain top quality. I have a passion for video games and technology. Throughout the years I have transferred that passion into the business world, especially in the realm of workflow automation. No small business is without those who double duty and I fall into the realm of those who wear many hats. My all time favorite hats though are online marketing and software development, even more so if I have the opportunity to combine the two.